A couple of weeks ago, I began posting the sequel to Reapers, tentatively entitled Beyond the Gateway. You can read Part One here and Part Two here. 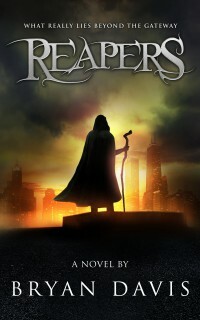 Here are links where you can purchase Reapers. Now that I have reminded readers of the back story, and Singapore has given Phoenix and Shanghai the information they need, it’s time for the heroes to evaluate the information and act on it. During their evaluation, I deepen the mystery surrounding the new spiritual revelation so that it is firmly planted in readers’ minds. I also reintroduce side characters, Crandyke and Tori, who will come into play later. This is character foreshadowing, showing them in an inactive state so that they don’t seem to come out of nowhere when they become active. The most important reintroduction is Alex, the antagonist. It is crucial to show her strengths immediately. It is always important that the antagonist appears to be stronger than the protagonist so that readers will wonder how the hero will overcome. “Let me think.” Shanghai looked upward and began humming. Then, she added words. No more to wander nor to roam. “Then Alex might as well know about it up front. She’ll eventually hear that we’re together anyway.” I led her to the alley opening where people bustled to and fro on the sidewalk as they headed to work or school on this brighter-than-usual morning. The every-present layer of haze seemed thinner than it had for weeks, and the sun, without its normal foggy filter, was almost too bright to view. I released Shanghai’s hand. “Let’s go in business mode.” I plugged my cloak into my sternum’s valve and raised the hood. Shanghai did the same. Two district hounds together always raised eyebrows, but no one would ask questions if we appeared to be seeking souls. “And girls,” a female voice added. Again using the staff for support, I walked with Shanghai into my apartment building and its vacant lobby. With electricity back in service for the day, we rode the elevator to the second floor and exited onto the hallway’s frayed carpet. Now close enough for Alex to hear us, I pressed the staff down softly as we walked to my unit. The door stood ajar. Alex was expecting us. When she took the staff, we lowered our hoods and nodded at each other. We could do this. Every bone aching, I straightened my body, opened the door fully, and walked in. Each step felt like walking barefoot on hot coals, but I managed to keep my face calm. Shanghai followed close behind. Alex sat in my reading chair, her gaze on an open book in her lap—my copy of 1984. Her blonde hair pulled back in a ponytail, she wore the black leather jacket typical of Death Enforcement Officers, open to expose a form-fitting white T-shirt and a sonic gun in a shoulder holster. Next to the chair, a silver gas tank stood upright in a wheeled carrier, a nozzle and tube attached at the top. A first-aid kit lay beside the base of the tank. I tensed. She knew our plans. She had already taken control of our meeting. Please post any questions and/or comments. I reeeeeeeeeeeeeaaaaaaaaaaaaaally don’t like her. Yep, I definitely mean Alex. The snake woman. I don’t mean Shanghai, she’s my favorite. I agree. Every time you write a villain, I think it’s impossible to detest anyone more…and you manage to outdo yourself consistently. From Devin, to Semiramis, to Drexel, and now Alex. It is as much the villains as the heroes that keep me turning pages. It’s the thrill of the hunt, I suppose. I think Drexel was the worst … until Alex. It is possible to create a villain who is too over-the-top evil. In my current work in progress, The Scent of Her Soul, I think I did that with the villain, so I pulled the reins back a bit to make him more believable. I understand. It’s hard to post story development lessons without spoilers. I might have to end this practice. My readership on Tuesdays dropped dramatically when I switched from the other book to this one. I love the last sentence! I love/hate Alex. I think I love how entertaining she is. She’s not a typical villain. And I keep seeing the actress who played her in the trailer now. So cool. Cannot wait for the book!